Today I woke up to large flakes drifting past my window and by the time I got to work we were in the middle of a snowstorm. It was delightful and added to the holiday spirit. On Wednesday, December 30th I am having an open house at Adams Mill in Moscow, Vt. from 4 to 7 pm. Please come if you get the opportunity. This is a chance to see the renovations that has been done on this historic home. The owners have kept the traditional Victorian farmhouse style on the exterior but have created a truly exciting modern interior. There are two units each with three bedrooms plus an office area. The four original stained glass windows have been kept and add a touch of color to the master bedrooms and the office area. The two bay windows, a part of the original house, grace the living room areas. Each unit has its own distinct personality. 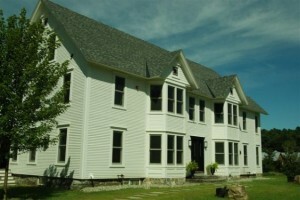 Available with each unit is a one car garage in a lovely carriage house. There is a studio above the garage with kitchen and bath that is available to be purchased for $160,000 with either unit. The south side is offered at $749,000 and the river side is offered at $859,000. Take Route 100 South from Stowe Village to the Moscow Rd. Turn right onto Moscow Rd. and follow the road to the first road on left, Barnes Hill Road. Bear left to the first right, Adams Mill Road. Bear right and go to the end of the road where you will see a large Victorian farmhouse.